Cute safari style beach hat for toddlers! Lightweight, packable, natural design sun hat. Quick-dry, breathable material keeps baby cool and comfortable. Short brim visor helps shield eyes from harmful sun rays. All-day, breathable sun protection-wet or dry. Neck flap covers & protects your little boys & girls skin from sun burns. Rear adjustable drawstring allows for a customized fit and grows with baby. You won't have to toss the summer hat out so quickly. 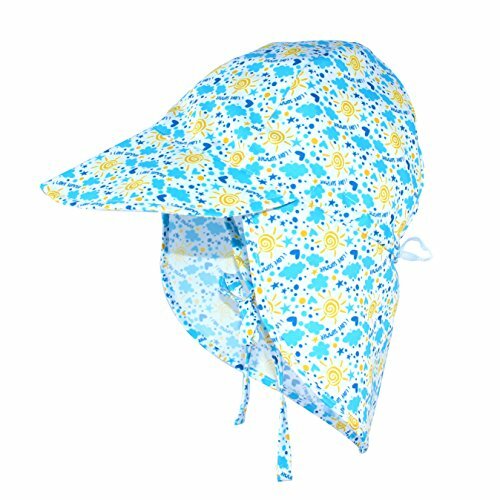 Chin strap helps hold hat in place during windy days; Provide great SPF 50+ UV protection for your toddler's face, neck and ears. Great for walk around the park, stroll at the beach, pool, swimming and more.